Monday November 30th 1891 I was busy about the house all morning, done some extra work up stairs. Will took me over town in the afternoon. I had a talk with Ott about family and money affairs and made arrangements to buy the property in Dwight I bargained for. I worked on a stand cover at night. Tuesday December 1st 1891 I got up early and Josie and I got an early start at the washing. We done some of the ironing in the afternoon. Lee was home to dinner. and Ott came over in the afternoon to talk about the Burlington business. I worked on my stand cover what time I had. Otts birthday. Wednesday December 2nd 1891 Mother went to town for the day. We finished the ironing and done a lot more washing today. We did not get it quite done by noon. I finished after dinner and let Josie go to town with her Mother. It was a cloudy dark evening. I put the clothes in the garrett. 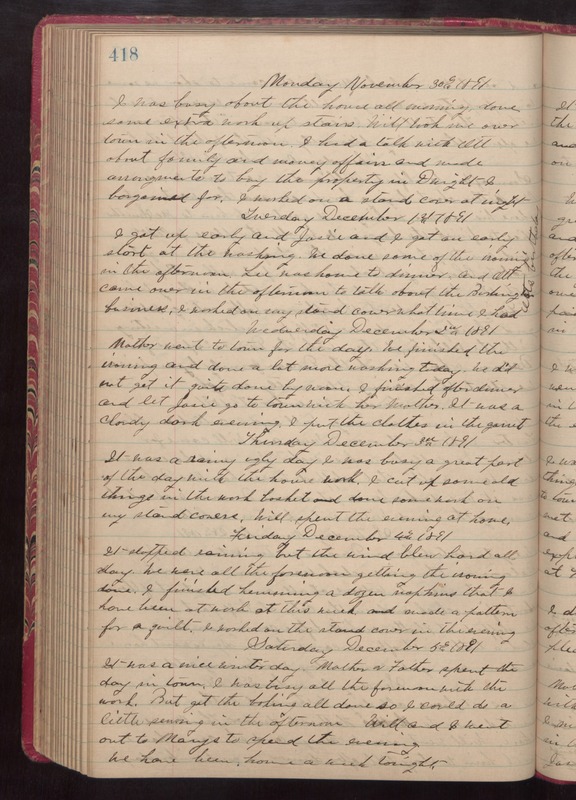 Thursday December 3rd 1891 It was a rainy ugly day I was busy a great part of the day with the house work. I cut up some old things in the work basket and done some work on my stand cover. Will spent the evening at home. Friday December 4th 1891 It stopped raining but the wind blew hard all day. We were all the forenoon getting the ironing done. I finished hemming a dozen napkins that I have been at work on this week. made a pattern for a quilt. I worked on the stand cover in the evening. Saturday December 5th 1891 It was a nice winter day. Mother & Father spent the day in town. I was busy all the forenoon with the work. But got the baking all done so I could so a little sewing in the afternoon. Will and I went out to Marys to spend the evening. We have been home a week tonight.